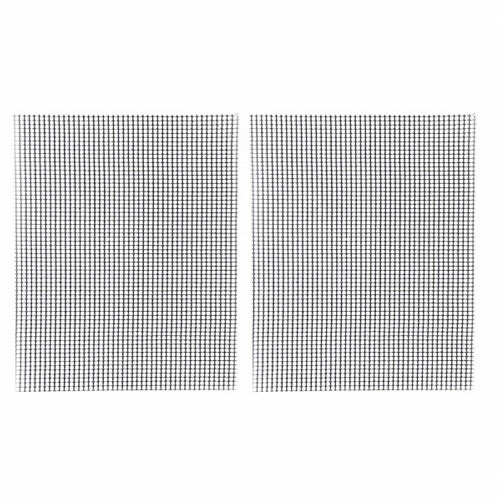 Non-Stick Mesh Grill Sheet – Set of 2 | Patio and Hearth Co. Grill your next meal with ease! The Charcoal Companion® Non-Stick Mesh Grill Sheets are the ideal grilling buddies. Food stays securely on the sheet during grilling, and the nonstick material allows for easy removal of food afterwards. Smoke flows through the mesh design to impart flavor onto your meat, veggies, fish, shrimp, bacon, wings and more. The flexible mesh material is heat-safe to 600°F (316°C) and reusable time and time again. To use, simply place the sheet on your grill and place your food on the sheet. Grilling food on the sheet instead of directly on grates also reduces clean up after your cookout. Dishwasher safe. Inquire about Non-Stick Mesh Grill Sheet – Set of 2 using the form below.